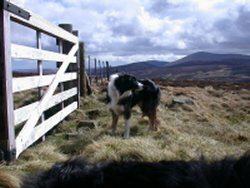 Dog friendly Holidays - how to get the best dog and pet friendly holiday cottages and holiday homes. With dogs holidays have to be chosen with care. Get it right and there is nothing better. An ideal holiday with the dogs has to be stress free. 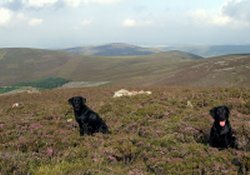 The cottage owners have to be sympathetic to the needs of dogs, the area safe with walks available both on the doorstep and nearby. Such ideal holiday homes are available up in the Cheviot hills of Northumberland. The College Valley has over 12,000 acres of unspoilt wilderness. 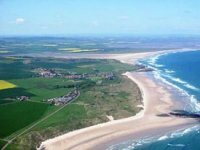 It is also close to the beautiful sandy beaches around Bamburgh. 1. Outside kennels with a water tap to clean the dogs. 2. Large tiled kitchen for the dogs to lie on as they dry off. 3. Enclosed garden, no neighbours, no busy road, in other words a safe place. 4. Walks all around with plenty of options for either short or long walks. 5. Inside the house there is plenty of room and no valuable ornaments at tail height. 6. A lovely real fire to settle down to. So what does the area have to offer? Well you have maybe 28 miles of quiet paths and walks, from St Cuthbert's Way, an ancient pilgrim route and then the Pennine Way across the Cheviot and into Scotland . There is plenty of choice. The Valley itself is steeped in history, with a prehistoric stone circle, Neolithic hill forts and a WW2 Flying fortress buried in the peat. There is also plenty of wild life from feral goats to deer, the occasional otter and lots of bird life. Outside the Valley a favourite place for dogs is the beautiful sandy beach between Bamburgh and Seahouses. The beach there is so wide and long that dogs can have their freedom to chase sticks and balls. Even on a bank holiday weekend it is not felt crowded out. 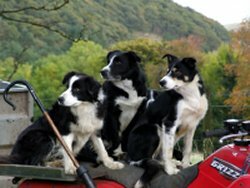 The dogs end up tired and happy but on returning to the Valley they can be put into the stream to clean down . After they have dried out the dogs can lie on the tiles in the kitchen whilst the log fire is set and dinner prepared. The town of Wooler is just 8 miles or so outside the Valley and most provisions can be purchased here. The Valley around here is called Glendale and it offers plenty of opportunities to explore. This area has lots of history. For the more adventurous there are also opportunities. Near to the Valley is the Border Gliding club where you can book beginner’s flights. As ideal as all this sounds it does not have to cost a fortune. 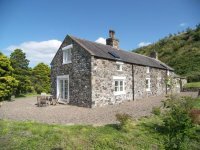 Here in Northumberland, most people want to holiday by the coast which means that coastal properties can cost a fortune to rent, but the good news is that when you start to look into the interior towards the more remote and unknown valleys you can get great value with prices around £385 per week for wonderful dog friendly holiday homes.